Georgia is a young jeweller living and working in Penwith, South West Cornwall. 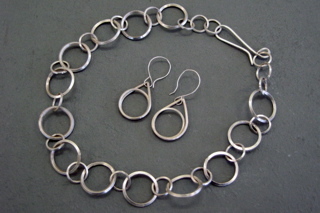 She completed a silversmithing course at the Mid Cornwall school of Jewellery and began working with silver and semi precious stones. Cornwall has a long history of jewellery making as an art form and her work follows that tradition.The jewellery is the result of a love and understanding of natural forms, sometimes incorporating the found objects into the pieces of work.